Some trading and charting software packages cannot read our "MetaStock" format data directly. However most of these packages can read text data (ascii/csv files), so the Premium Data Converter (PDC) program was created to convert our stocks, futures and forex databases into text files. As the data importing needs of each trading/charting package vary slightly, we have made the PDC parameters user configurable (see the screenshot below) so that you can export the text data in the exact format that you require. In theory, the PDC can be used on ANY "MetaStock" format database, however we can only provide support when using it on our own data. 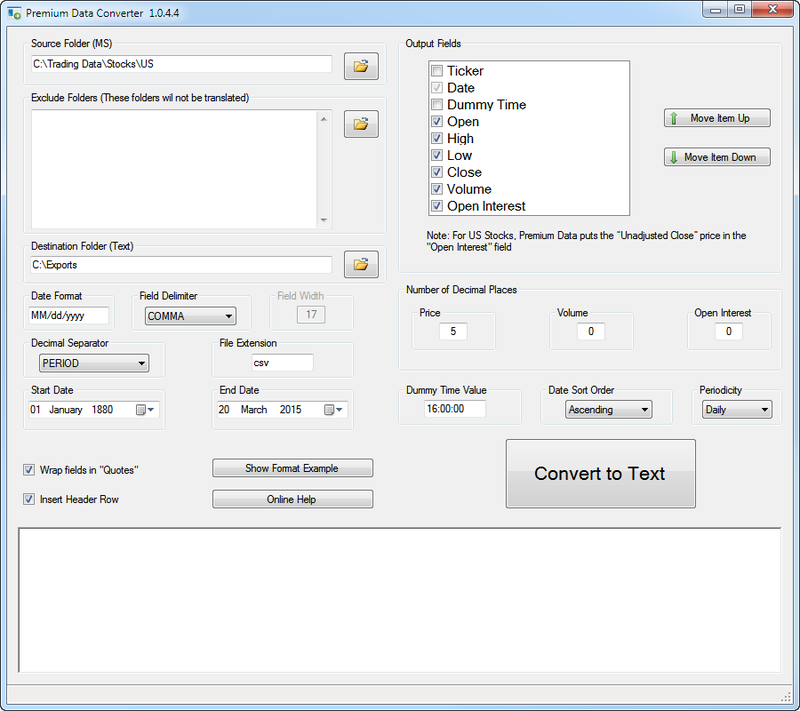 The Premium Data Converter is available free-of-charge to subscribers and trial users. You will find the PDC in our Downloads Area. If you are not a client and you would like to use the PDC, you can sign up for a free trial to get access to it. Credit card details are not required and there is no obligation to subscribe. For help on using the Premium Data Converter, see this page.